Some of the most important items are based on your ability to create a safer working environment. An environment that some may call “idiot proof” (that’s not a bad name, though; the less your people have to know to be safe, the better. Safety should be simple). Don’t operate a conveyor without guards. This is an entirely controllable factor that resides with your maintenance department. Making certain conveyors don’t expose moving parts or motors is critical to safety, as some of the most common accidents are due to fingers or hair caught in machinery. The important takeaway is that anything that moves, rolls, pulls or pushes should be guarded from fingers and hands as much as possible. This is an inexpensive and mandatory safety measure. 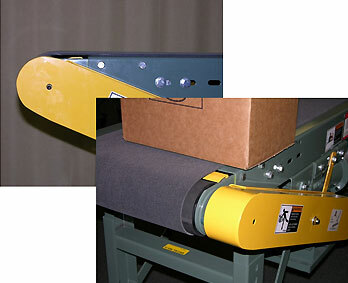 Conveyors that are well-maintained are not only more reliable; they are safer. This means maintaining safety factors like emergency stops, switches, control panels, motors and belting. Anything that can snag might pose a danger, including loose parts or belting. Maintenance helps you head off these problems. It’s mandatory for power systems to have visible emergency stops accessible across the conveyor line so that it can be stopped in case of an accident. But more than just having them, you must check them for effectiveness, train your people and be sure they are visible and easily accessible. 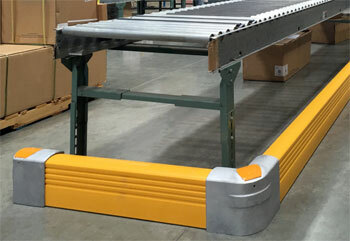 Installing guard rails around the base of the conveyor when it’s exposed to forklifts, walkies or other industrial equipment makes everyone in the vicinity safer in the event of a driver error that could damage, tip or move the conveyor. When conveyors feed machinery, transition to other conveyors, sort, or integrate with a lift there can be safety issues that don’t exist elsewhere in a longer production line. This means you must train the people who work in those spaces on any dangers. You must find guarding that reduces the exposure to these areas as well. Many fall under the guarded by location standard, but not all. When items are conveyed overhead, either with overhead systems or standard conveyors mounted at height, measures to prevent falling items, components or hardware from hitting people below are necessary. These measures may include safety nets that can catch falling items, but may also include underside pans that catch hardware. Start for success. Implement a process for starting your system that focuses on clearing any areas where moving parts are present as the conveyor starts up. Stop the conveyor before dealing with jams or snags. Do it the same way every time. Keep your hands off — unless they need to be on. Train people to avoid touching a moving belt. This appears to be safe to some operators, causing employees to be lax around the belt at time. Dress for success–and safety. Discourage operators from wearing saggy clothes, jewelry, long hair or anything else that can be caught in the conveyor when it’s running. This is a particularly dangerous situation with visitors, who may come in with loose-sleeved coats, watches, etc. Be sure people who are near the conveyor are appropriately and safely dressed. Don’t let people get distracted. Smoking and eating, as well as cell phone use should not be allowed while on shift and near the conveyor. No amateurs. Those who aren’t trained to operate or interact with the conveyor shouldn’t be in the area. The good part is that you should be able to fully train order pickers and operators fairly quickly. Clear jams in a safe manner. Don’t allow people who aren’t qualified to clear jams or generally reach into the conveyor. Be sure the conveyor is stopped and locked out before anyone attempts to clear a jam. Conveyor is generally safe warehouse equipment, assuming you take the right precautions, train your team and set the table for success. If you have questions about conveyor safety, let us know.